You didn’t think it would be this intense. You’re ushered into the white-walled, slightly warm and claustrophobic space of the fifth-floor gallery in the Marshall Building, and you step into another world. It could be a museum diorama of an alien planet; it could be a disturbed dream. It could be taking place on a glass slide of some gargantuan microscope or a brutalist ballet in a mental asylum. Two human bodies, clad in minimal flesh-tinted garments, lay supine on a mud-smeared square that takes up nearly the entire room. 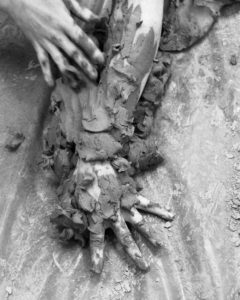 Their exposed skin, too, is partially crusted with clay. Dozens of fist-sized gray lumps dot the floor between them. Composer/musician Olivia Valenza’s clarinet samples create a moody soundscape, mixed with a weird spoken-word LP disc which she manipulates on a turntable. The dancers slowly stir. Their movements are blind, searching; there’s no reference to human psychology as they move, heap up, break down, and smear the gray earth over the plastic surface and eventually themselves. We’re necessarily drawn to contemplate the performers’ bodies, the contours of skin over muscle and bone, the creases of knees and elbows, the flexing tendons of phalanges. It’s as de-sensualized as a life-drawing class. 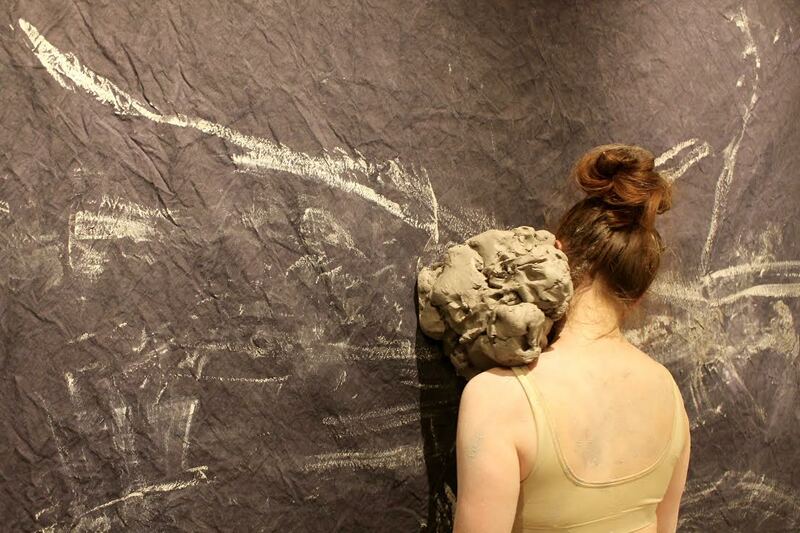 Cambrian, an original work produced by Cooperative Performance Milwaukee, is a 45 minute structured improvisation with two dancers, one musician, and about a hundred pounds of clay. An ambitious animated sculpture by painter Brennen Steines, its success emerges from a fortunate confluence of carefully-defined parameters and virtuosic performances. In concept it recalls a principle introduced by John Cage, who said he didn’t imitate nature, but its method of operation. It’s extremely abstract—and not for everyone. Still, there isn’t very much ecological theater in today’s performance scene: in media dominated by human concerns, there’s little thought for the non-verbal dramas of the natural world. So when a performance comes along that eschews human-centered dramatic concerns to focus on the processes that shape life on earth—it’s news. Choreographer Liz Faraglia developed the moves out of extended improvisations by performers Kelly Radermacher and Don Russell, which she then cut and pasted into a loose movement score. The rest depends on the impulse of the moment and the behavior of the clay. The raw elemental quality of the movement recalls Butoh, an avant-garde Japanese dance form, and the improvisational structure of the piece echoes Noh theater, which similarly combined dance, music and narrative to evoke long-dead spirits. The music and the movement seem to chase each other in a nonlinear game of tag. This demands utter commitment from the players; there’s no room for faking it. We don’t see the characteristic activities of life: eating, reproduction, or competition for resources. “There’s nothing really literal about it,” said Steins. “The performers serve the role of the ghost of life’s activity millions of years ago; not to portray life over history, but rather to translate the action of life over history.” All seems to take place at a developmental stage when organisms were just beginning to figure out how to join themselves into multi-cellular symbiosis. We seem to be witnessing a process of trial and error, motivated by inchoate urges towards greater complexity. The overall effect of the performance is cumulative, laying down strata of impressions like sedimentary rock: the performer’s disarming vulnerability, the abject look of mud-caked skin, their blank gazes reflecting bare subjectivity devoid of human psychology. We see none of the interpersonal dynamics that constitute conventional theater: nothing suggests the interactions of a man and woman. We see tension, collaboration, clashes of impulse that represent momentary imbalances to be resolved. Their writhing, methodical efforts to solve problems we can only surmise, involving weight, contact, sensation. The sight and sound of clay being squeezed through fingers, smeared over surfaces, thrown to the floor with forceful splats. Like a musical composition, the 45 minutes pass with an almost symphonic progression. We’re encouraged to move around as when viewing a sculpture; we can angle for a better view— only to find the view has changed when we get there. As personal and intimate as this experience may be, the piece is grounded in a concept of life uncannily similar to biopoetics. Articulated by biologists Francisco Varela and Andreas Weber, eco-philosopher David Abrams, and even Lynn Margulis, author of the Gaia Hypothesis, biopoetics revolutionizes thinking about life by presupposing that all living things have innate subjectivity, desire, and the power of choice—even at the cellular level. Life is in essence the creation of meaning, and it’s basic expression is aesthetic, be it the splash of a fish or the tint of a rose; all speak what Weber calls “the lingua franca of life.” Cambrian enacts a systems model of life that could apply, fractal-like, at any scale—from the actions of ancient microorganisms to the Cambrian explosion; from humans’ influence on the global environment to you making decisions in your everyday life—it’s all based on your desire, pursuing your personal impulses, with the traces this activity leaves on the world.